One of the biggest problems facing accompanying-partners when they move abroad is the loss of their professional identity. Doing ‘nothing’ all the day might be fun for a while, but for how long? If you are used to working, or if you left behind a career that you really enjoyed, it can be very hard, and finding another job in a foreign country is not always easy. A Career In Your Suitcase by Jo Parfitt and Colleen Reichrath-Smith helps you to build a ‘portable’ career that can relocate with you, wherever you go. One of the perks of being an expat spouse is that you are generally not expected to produce a second income; so this could be a wonderful opportunity to find something that you love doing; whatever it is that energises you in the morning, and turn it into a new career, with a pay cheque. The authors have included practical exercises and anecdotal stories, designed to make you look deep inside yourself, to help you discover your true passions and combine them with your skills. There is also a whole chapter on networking: how to build one, and using it to create valuable opportunities for you and your career. A Career In Your Suitcase will help you to find your creative flair, and give you the adaptability to rediscover the professional in yourself no matter where you find yourself living. 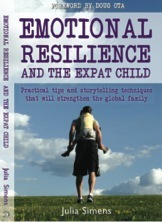 When it comes to helping expat children navigate cross-cultural life, Julia Simens’ Emotional Resilience And The Expat Child: Practical Tips and Storytelling Techniques That Will Strengthen the Global Family is a must-read. An educator, consultant, speaker and seasoned expat parent whose focus includes family therapy, early childhood education and international relocation, Simens has helped thousands of families transition between cultures and adjust to their global lifestyle. A veteran of many cross-cultural moves herself, Simens knows firsthand the challenges families face when adjusting to life in a new country. She highlights the significance of healthy relationships for expat children to thrive, including the importance of accurately identifying, expressing and coping with their emotions before, during and after such transitions. This includes learning to read their body’s cues and those situations or actions which might trigger positive and negative emotions. Awareness of how they tend to react in different circumstances helps children – and adults as well – make sense of their surroundings, an especially useful skill when encountering a new culture. In addition to concrete suggestions for helping children of all ages share their thoughts and feelings, Emotional Resilience and the Expat Child offers ways to maintain a supportive home environment and foster familial and other connections. Chief among these are sharing life stories and developing rituals. Simens encourages finding ways the individual and family can honour experiences and create memories of people and places that matter. No expat family bookshelf is complete without this insightful guide to enhancing the emotional resilience of young children and teens alike. Instead, on repatriating to Canada three years ago, I found myself diving rapidly into self-destruct mode from my weak and reluctant attempts to settle back into life as a Canadian. It never occurred to me that trying to integrate myself back into my own country of origin would be such a shock, or so difficult. The well-travelled, social butterfly, and outgoing dinner party host that I exuded in my life in the UK, quickly evaporated and morphed into an unmotivated, unsociable, regret-filled wanderer. I spent my days wishing I had never left England. The Emotionally Resilient Expat by Linda A. Janssen helped me understand that I was mourning the loss of my life as I knew it. That even the simplest of daily tasks can turn into gargantuan efforts when we are out of our comfort zones. Inadvertently, Janssen touched on every thought, feeling and personal struggle that I encountered in my life as an expat. Reading the book, helped me to put some closure on the stumbling around that ensued as soon as I returned to Canadian soil, and comforted me with the knowledge that I hadn’t suffered a breakdown. I had simply returned to a life that I didn’t know anymore, and couldn’t immediately relate to! I had the emotional resilience to get on with my life, but it took me a while to tap into that skill. The excerpts from other expats that author Linda A. Janssen has included, were wonderful demonstrations of human efforts to forge a life in foreign surroundings and shows that this vast network of expats around the globe, all experience the same challenges, all trying to find ways to make the most of their ever-changing lives. The Emotionally Resilient Expat is a very readable survival manual, and the insightful and loving friend that you can pick up and take with you, wherever you may end up. For many non-US students, enrolling at an American university seems to be the unattainable dream. To pack a suitcase, board an aeroplane, and sign up for a law degree at NYU or a business degree at Harvard – is something that only happens to elite students miraculously discovered by US college recruiters in the movies. Right? Wrong. A new book: The Stress-Free Guide To Studying In The States: A Step-By-Step Plan for International Students, dispels the myth that admission to universities and colleges is limited to ‘the chosen few’ and supports the reality that international students make up 21% of the student population in the US. Toni Summers Hargis (a British-born expat living in the US) takes prospective students through the process of researching suitable universities and courses; assessing their potential for admission based on selection criteria; identifying options for financial aid; uncovering government regulations including the restrictions of living and studying under a foreign student visa; and dissecting American student life to give valuable survival tips for new students. Succinctly, the author addresses the needs of her target audience i.e. young adults and their parents. Procedures are covered in a task-oriented, step-by-step format. Clearly presented facts are enriched by supplementary explanations, tips, warnings and resource lists. Additional inclusion of topics like - how to write personal essays; homesickness and culture shock; room mates; sports; laws on alcohol and drugs; insurance; and study loads - make this book a truly comprehensive guide essential for prospective students wanting to realise their dreams of an American higher education.